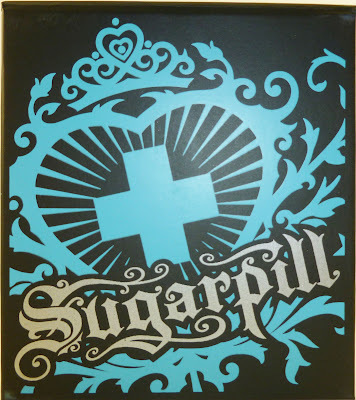 The Sugarpill Heart Breaker palette released a little over a month ago with much anticipation from their fans. All over the world, anxious addicts awaited the release of the new shades. I will admit, I waited until midnight eastern time to order my palette. I had to make sure I was one of the first to try out the new stuff. Waking up a little sleepy the next day was worth the wait and I’m very excited to share mt Sugarpill HeartBreaker Palette Review. I have been playing and experimenting for a few weeks to a get a feel for the new colors. It took me forever to get this review up, but here it is finally! The palette packaging is still uber cute and colorful, except this time it’s blue instead of pink. Nothing wrong with a little change. As you can see above the palette, which also has a mirror comes with four pans of eyeshadow. The palette is truly adorable, but for MUA’s who wish to travel light (such as myself), the shadows easily pop out for transferring to a Z-palette. For those who are not familiar with the brand, these are jumbo sized eye shadow pans, large than a US quater. 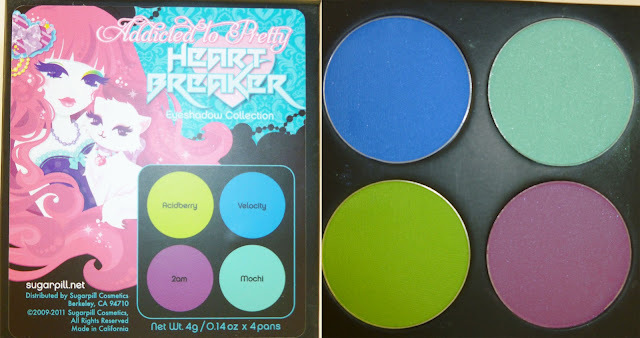 The cost for the Heart Breaker palette is $34.00, which remains the same as the previously released palettes. Can’t complain about the price, considering the amount of product for the price ($8.50 per shadow). Not too shabby! Each swatch consist of about three strokes of shadow applied to my bare skin without any primer or base. The photo was taken in natural lighting. Here’s my take on each shade. Acidberry- This electric green shade with a slight shimmer was the color I really didn’t care for before receiving the palette. However, after trying it, it has became one of my favorite colors. The consistency is great and the shade is very pigmented. It looks awesome with a primer and is a sizzling color for summer. Velocity- This shade kind of reminds me of a matte version of Royal Sugar. The color blends pretty good and is ok in the level of intensity once applied. In my opinion, it’s nothing special. 2am- Initially I was excited for this color.It reminds me of a lighter version of poison plum, so I thought it would be a good color to smoke it out with. After using the color, I wasn’t crazy about it. It doesn’t blend as well as I would like and it isn’t very pigmented. I think with some more experimenting, I can learn to incorporate it into my looks more often. Mochi- I was sure I was going to hate this color. But to my surprise, it’s hands down my favorite color from the palette! It’s super pigmented, sparkly and looks superb with just black eyeliner and mascara. This is officially my go-to shade for the summer. This is a simple Look I created using 2am and Mochi as a liner. 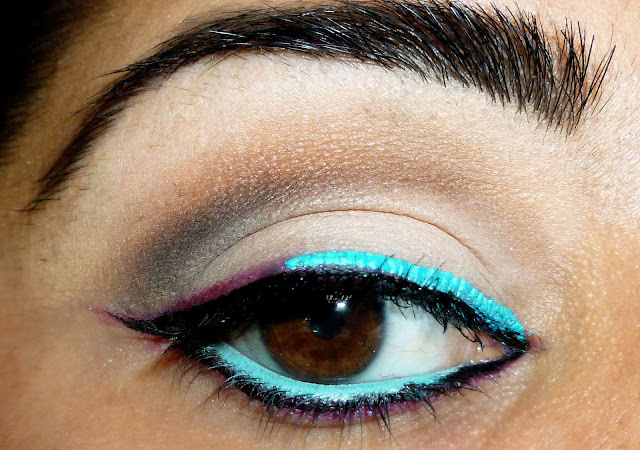 Very easy to do while creating a statement look. Who else has the palette? What do you think of it so far? Lime Crime Uniliner Review + My Birthday post! MAC Candy Yum Yum: 5 ways to rock a neon pink pout! It’s a lovely palette, but you are calling Mochi, Midori.XD It’s called Mochi not Midori. How did you use midori on the waterline? That looks pretty cool! Luna- thank you for the correction! I must have mixed up my sugarpill shades trying to rush to get the post up! I appreciate you pointing that out 🙂 I will fix it ASAP. Janine- I first applied a white eye liner on the water line, then using a small angled brush I applied the color. I’ve never heard of this, but the colors sure look like fun. You have to check out sugarpillshop.com, I promise you will not be disappointed!